Marine mammals represent a family of vertebrate animals that is very diverse in terms of shape, structure and adaptation. This includes cetaceans (whales, dolphins and porpoises), sirenia (manatees) and certain carnivores such as pinnipeds (seals and sea lions, among others), polar bears and sea otters. At the Interactive Aquarium Cancún you can watch and interact with two marine mammal species: the bottlenose dolphin (Tursiops truncatus) and sea lion (Otaria flavescens). 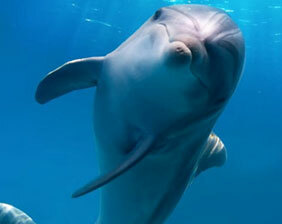 The bottlenose dolphin is just one of 37 species of dolphins (Delphinidae family). It is found in temperate and tropical waters around the world and lives in coastal and open water ecosystems, as well as in estuaries and, occasionally, in rivers. Its diet consists of fish, mollusks and crustaceans, and although it has about 100 teeth, it swallows its food without chewing it. It consumes an average of 8 to 15 kg per day, depending on its gender, age and reproductive condition. Bottlenose dolphins are social animals which means that they generally swim in groups or "alliances" to make getting food easier, to reproduce or fend off potential predators. Habitat: They live in tropical waters and other warm waters around the world. Fun Fact: Dolphins can reach speeds of approximately 30 km/h (18.6 m/h). They are mammals with certain adaptations that allow them to come ashore to procreate. They are carnivorous and move around using their forelimbs, unlike seals. 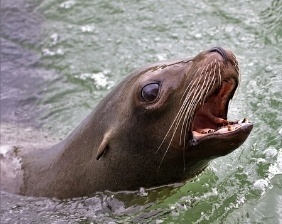 The sea lion eats fish, which is its staple food. It can eat up to 20 kilos (44 lbs) each day. It feeds on a wide variety of marine resources such as crustaceans, mollusks and fish. Size: Males measure up to 2.5 meters and females up to 2 meters. Fun Fact: Male adults have a very large head with a well-developed mane, hence the name sea lion.